AYO ALL and happy MF Friday! Today I’m going to be reviewing the Campbel mod kit by Smoant Disclaimer: I was provided this product for the purpose of this review by Smoant. The Campbel is Smoant’s very interesting, but definitely new take on the vape industry. While all other devices give raw vapor, this device percolates the vapor through a favorite soft drink or juice before inhaling. The theory being that the vapor should pick up some of the flavors/qualities of the liquid used and add it to the original ejuice being used. I have some cough past experience with these kind of devices and I’ve tried to do similar stunts before but with no success. The Campbel is a regulated mod that is designed to operate with the suuuuuper long atty that it comes with and it utilizes a single 18650 cell. First off, the presentation of the Campbel is very well done. Very simple but classy. Paying attention to the simple small details that makes it look like your opening a high-end product. Once assembled, I was astounded by how freaking tall it was. It’s literally the Sears tower (yes, I know its Willis but it will forever be Sears in my heart) of the vape world. At 218mm tall the Campbel is comparable to my stacked mech mods! The battery door is simple to use however the negative orientation on the door needs to be a different color to stand out more. It also uses 3 small LED lights to notify when the battery is drained. Though overall, the Campbel mod just feels kind of cheap. Maybe it’s due to the packaging and making me feel like I’m getting a grade-A product, but the plastic feels thinner than most. Lastly the drip tip comes with an airflow vent of its own to use alongside the base airflow. CAMPBEL USE 5 clicks to turn it on/off. Done… Well while that sums up the overall use, there is a bit of prep work involved at first. First the ejuice tank needs to be screwed on with the coil in place. The top of it screws off allowing for refilling. Once that is complete, the juice filter section screws on top. Once installed, there is a line showing the maximum suggested amount of drink to use. I found it best to always be below the line. Also need to mention that it should also be used upright to prevent spitback issues. Once filled, the outer shell of the tank slides on and it’s good to go. CAMPBEL PERFORMANCE To sum it up in one word: bad. The Campbel even without any beverage in it produced heavily muted flavor. It is so poor that I could not tell a big difference between flavored and unflavored ejuice! With the juice added to the filter section it kind-of improved but not really. I found that it made the vapor take more of the properties of the juice than the actual flavor. I.E. sodas produced a fizzy sensation due to the carbonation. I tested it with several sodas, kids juice, orange juice, and powerade but I still was not getting any good added flavor. So I reached out to Smoant to ask them what they recommend or what they have success using with. Unfortunately, I could not get a definite answer as it was suggested that it’s good with all sodas and drinks. However, I also learned that it was originally designed to be used with whisky/bourbon. It 100% sketched me out to try it but after several days using I was quite positive that no juice from the filter end was making it into the coil. So I gave it a shot, and like most would guess it gave the most flavor from all the other liquids but it still was not good. I was frustrated and annoyed but them something hit me that I hadn’t thought of before. If it looks like a bong, acts like a bong, then… it is a bong! For those unaware, that way one basically operates is that you “milk” the chamber up then inhale what is in it. You can fill up the chamber lightly or heavily depending on what your preference is. So what if the Campbel works in the same regards? Remember the airflow channels in the drip tip, well I shut those off took a 5-6sec rip to “milk” the filter chamber then opened the airflow. To my surprise I got OK flavor. Not great by any stretch of the imagination, but enough to at least calm me down. The drawback, however, was that it cause way more spitback than usual with this method. The coils weren’t really that great either. Though I attribute most of the mute flavor from the distance the vapor has to travel. In general, they did not last that long (about 70ml avg.) but due to the poor flavor it was honestly hard to really pinpoint when the coils performance started slipping. The Campbel is quite an interesting new take on the vape industry. However, I do not see a system like this going anywhere mainly due to the overall size. That said, I an incline to think that a multiple percolation system would be needed to give any sort of good flavor with the beverage used. The downside of this is that adding more filters doesn’t reduce the size but adds to it. The one thing that annoyed me the most was that even without juice in the filter it produces little to no flavor. I’d think that the first step to making something like this would be to make sure the atty is a strong performer first or foremost. The Campbel is going to get two thumbs way down in my book. No bonus point given for uniqueness as its performance was just so bad that it overrides it. I wouldn’t even suggest trying it as I’m certain you’d be disappointed. Honestly I’m quite perturbed that Smoant, with its overall good reputation, would give the OK on something like this. Hopefully this is just a one-and-done and they go back to doing that they do best. I also regularly post on Twitter and Vaffle (DarksunVapes) if interested. Thanks for reading! Live long and vape on! Quality Control & Sample v. Retail Disclaimer – I do not control what device I test as what is in my hands may be slightly different than others. Additionally, there tends to be differences between samples (what is usually delivered to me) versus the final retail product. As with all mods/attys, I strongly recommend to not pre-order anything and wait a minimum or 30 days after it’s out to determine if any changes have occurred. AYO ALL and happy MF Friday! Today I’m going to be reviewing the Campbel mod kit by Smoant Disclaimer: I was provided this product for the purpose of this review by Smoant.INTROThe Campbel is Smoant’s very interesting, but definitely new take on the vape industry. While all other devices give raw vapor, this device percolates the vapor through a favorite soft drink or juice before inhaling. The theory being that the vapor should pick up some of the flavors/qualities of the liquid used and add it to the original ejuice being used. I have some cough past experience with these kind of devices and I’ve tried to do similar stunts before but with no success.The Campbel is a regulated mod that is designed to operate with the suuuuuper long atty that it comes with and it utilizes a single 18650 cell.Photo Album HereSPECIFICATIONSCAMPBELSize: 55mm x 30mm x 77mmRange: 1-80w (nonadjustable)Resistance Range: 0.08ohm – 3.0ohmBatteries: 18650Colors: black, blue, goldCAMPBEL TANKSize: 24mm x 141mmCapacity: 3ml (ejuice)Colors: matches the tankPACKAGINGCampbel + Campbel tankSpare parts and extras – o-rings, mod & tank manuals, warranty/inspection cardsSpare ejuice tank and normal juice tank2x Ni80 coils (0.20ohm) one pre-installedUSB charging cableOVERVIEWFirst off, the presentation of the Campbel is very well done. Very simple but classy. Paying attention to the simple small details that makes it look like your opening a high-end product. Once assembled, I was astounded by how freaking tall it was. It’s literally the Sears tower (yes, I know its Willis but it will forever be Sears in my heart) of the vape world. At 218mm tall the Campbel is comparable to my stacked mech mods!The battery door is simple to use however the negative orientation on the door needs to be a different color to stand out more. It also uses 3 small LED lights to notify when the battery is drained. Though overall, the Campbel mod just feels kind of cheap. Maybe it’s due to the packaging and making me feel like I’m getting a grade-A product, but the plastic feels thinner than most. Lastly the drip tip comes with an airflow vent of its own to use alongside the base airflow.CAMPBEL USE 5 clicks to turn it on/off. Done… Well while that sums up the overall use, there is a bit of prep work involved at first. First the ejuice tank needs to be screwed on with the coil in place. The top of it screws off allowing for refilling. Once that is complete, the juice filter section screws on top. Once installed, there is a line showing the maximum suggested amount of drink to use. I found it best to always be below the line. Also need to mention that it should also be used upright to prevent spitback issues. Once filled, the outer shell of the tank slides on and it’s good to go.CAMPBEL PERFORMANCE To sum it up in one word: bad. The Campbel even without any beverage in it produced heavily muted flavor. It is so poor that I could not tell a big difference between flavored and unflavored ejuice! With the juice added to the filter section it kind-of improved but not really. I found that it made the vapor take more of the properties of the juice than the actual flavor. I.E. sodas produced a fizzy sensation due to the carbonation.I tested it with several sodas, kids juice, orange juice, and powerade but I still was not getting any good added flavor. So I reached out to Smoant to ask them what they recommend or what they have success using with. Unfortunately, I could not get a definite answer as it was suggested that it’s good with all sodas and drinks. However, I also learned that it was originally designed to be used with whisky/bourbon. It 100% sketched me out to try it but after several days using I was quite positive that no juice from the filter end was making it into the coil. So I gave it a shot, and like most would guess it gave the most flavor from all the other liquids but it still was not good.I was frustrated and annoyed but them something hit me that I hadn’t thought of before. If it looks like a bong, acts like a bong, then… it is a bong! For those unaware, that way one basically operates is that you “milk” the chamber up then inhale what is in it. You can fill up the chamber lightly or heavily depending on what your preference is. So what if the Campbel works in the same regards? Remember the airflow channels in the drip tip, well I shut those off took a 5-6sec rip to “milk” the filter chamber then opened the airflow. To my surprise I got OK flavor. Not great by any stretch of the imagination, but enough to at least calm me down. The drawback, however, was that it cause way more spitback than usual with this method.The coils weren’t really that great either. Though I attribute most of the mute flavor from the distance the vapor has to travel. In general, they did not last that long (about 70ml avg.) but due to the poor flavor it was honestly hard to really pinpoint when the coils performance started slipping.CONCLUSIONThe Campbel is quite an interesting new take on the vape industry. However, I do not see a system like this going anywhere mainly due to the overall size. That said, I an incline to think that a multiple percolation system would be needed to give any sort of good flavor with the beverage used. The downside of this is that adding more filters doesn’t reduce the size but adds to it.The one thing that annoyed me the most was that even without juice in the filter it produces little to no flavor. I’d think that the first step to making something like this would be to make sure the atty is a strong performer first or foremost.PROSMinor – Presentation of the deviceCONSPoor flavorFriggin HUUUGE!SpitbackLow quality feel (mod)CoilsMinor – battery orientationWOULD I RECOMMEND?The Campbel is going to get two thumbs way down in my book. No bonus point given for uniqueness as its performance was just so bad that it overrides it. I wouldn’t even suggest trying it as I’m certain you’d be disappointed. Honestly I’m quite perturbed that Smoant, with its overall good reputation, would give the OK on something like this. 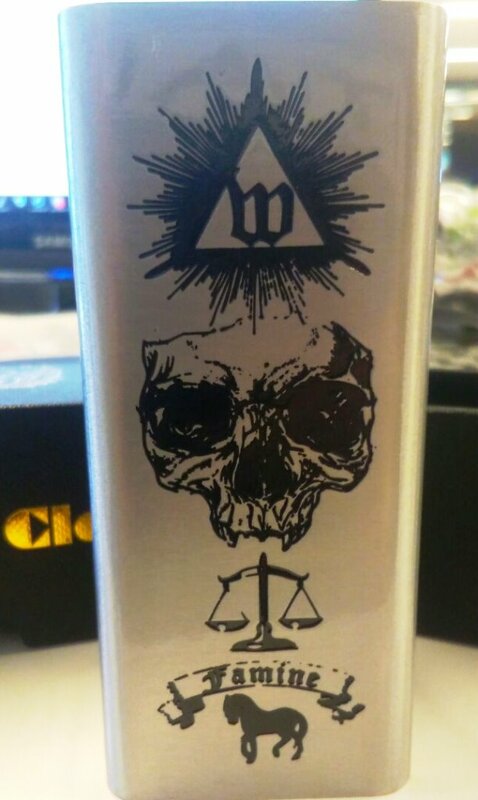 Hopefully this is just a one-and-done and they go back to doing that they do best.I also regularly post on Twitter and Vaffle (DarksunVapes) if interested.Personal recommended reviews:RTA/RDA/RDTA- Ray RTA – Conspiracy RDA – Drop RDA – Battlestar RDA – DPRO RDA – Gaia RDTAMODS- 101 Pro Kit – Aurora (BF) – Crea BF Mech – Alpha One – Charon VV – Solo 2 – Drag – Mage Mech Tricker KitComparative Overviews- Crea v. SqueezerThanks for reading! Live long and vape on!Quality Control & Sample v. Retail Disclaimer – I do not control what device I test as what is in my hands may be slightly different than others. Additionally, there tends to be differences between samples (what is usually delivered to me) versus the final retail product. As with all mods/attys, I strongly recommend to not pre-order anything and wait a minimum or 30 days after it’s out to determine if any changes have occurred.